Solid electrolyte capacitors commonly consist of a tantalum wire, embedded in a sintered porous tantalum metal powder compact, on which an amorphous, dielectric layer of tantalum pentoxide is electrochemically formed on the surface. The anodized body is then equipped with a conductive MnO2 counter-electrode which is applied by impregnation with an aqueous solution of Mn(NO3)2 and subsequent pyrolysis at elevated temperatures, connected to a cathode wire and encapsulated in epoxy resin. Alternatively, conducting polymers can also be used for impregnation. These types of capacitors are used for all kinds of applications within the telecommunication- and computer market. In computers, especially notebooks, they serve as buffer and smoothing capacitors in the power supplies for the main board and processor, disk drives and other plug-in modules. Over the last decades, the driving trend within this field of industry has always been miniaturization and higher performance which resulted in the necessity to search for new material systems capable to supplement the currently used tantalum metal powders. One logical substitute has always been niobium since tantalum and niobium are very similar in their chemical and physical properties. Moreover, niobium is much more abundant which therefore results in lower raw material price of the metal powders. The aim of the present study, a cooperation between industry and university research, is the production and characterization of solid electrolyte capacitors based on newly developed capacitor-grade niobium powders in order to gain a comprehensive understanding of the correlation between processing parameters, microstructure development and resulting electrical parameters within these newly developed electronic devices. Therefore, for example, the thickness of the amorphous niobium oxide layer depending on processing parameters was measured, resulting in the determination of a linear dielectric layer growth with respect to the applied anodization voltage and a given anodization temperature. Higher anodization temperatures lead to enhanced oxide layer growth, hence resulting in higher oxide layer thickness values. 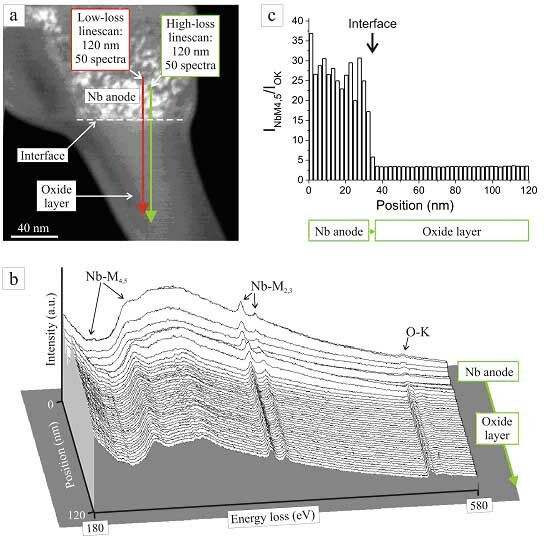 In addition to SEM investigations, high resolution transmission electron microscopy (HRTEM) and energy-filtered selected area electron diffraction (SAED) were employed to study the microstructure within the layered system of niobium metal and dielectric niobium oxide, also subject to processing parameters. The individual crystals of the niobium powder grains are homogeneously covered by an amorphous oxide layer that can be clearly distinguished from niobium grains. Utilizing HRTEM, it could be shown that the anodically formed oxide layer is completely homogeneous since no indication for phase separations and/or nucleation or crystallization phenomena of any crystalline phases larger than 1 nm could be found after anodization and subsequent annealing at 320°C in air. One major drawback of niobium solid electrolytic capacitors which is often mentioned in the literature is the thermally driven dielectric layer degradation which is much more prominent than in the currently used tantalum capacitors. In fact, there is an obvious change in electrical properties (leakage current increase of one order of magnitude) when measuring the electrical properties of niobium capacitors before and after annealing of the anodes. Based on the HRTEM investigations, the reason for these detectable changes in electrical properties remain still unclear from the microscopic point of view. One fact that could explain the changes in electrical properties and complicates the niobium-oxygen dielectric system is the existence of additional stable and metastable oxide phases with a wide range of different electrical properties (NbO-metallic conducting, NbO2–semiconducting) besides the desired dielectric niobium pentoxide which do not exist for the tantalum-oxide system. In context with the study of Nb-based capacitors, a comprehensive electron energy-loss spectroscopy (EELS) study of niobium, stable niobium-oxide phases, and anodically grown niobium-oxide layers was carried out . Phase fingerprints and quantitative EELS data were analyzed in a systematic manner using niobium and stoichiometric Nb-oxides with the different formal oxidation states 0 (Nb), +2 (NbO), +4 (NbO2) and +5 (Nb2O5) as reference materials . Numerous characteristic EELS features were identified which allow to distinguish between different Nb-oxidation states. Optimized k factors were experimentally determined for the Nb-O system which provide a particularly efficient composition-quantification tool where accuracy and precision of the order of 0.5% and ±2% were shown to be possible . The results oobtained for the reference materials were applied to the investigation of solid-electrolyte capacitor structures with Nb as anode material. The composition of the dielectric oxide layer and the interface between anode and oxide layer were characterized on a nanometer scale and discussed in terms of capacitor electrical properties and influence of heat treatments. Quantitative EELS was performed to analyse the composition of Nb2O5 dielectric layers. An EELS linescan across a Nb/Nb2O5 interface is shown below. Quantification of the Nb- und O-concentration yield a slight O-deficiency which depends on the thermal treatment of the capacitor structures .